The issue that arises for me from watching last night’s pre-“Super Tuesday” Republican show goes like this: 1. is this Performance Art, Blood Sport, Gladiatorial reprise? Is it assumed that the viewers, including the Republican base, will come out with a more favorable impression of ANYBODY on stage having seen this?, and 2. Where were the MEDIA? I mean not only the CNN crew last night, but the commentators today. There was a lot about who landed the most telling punches, but little about the “substance” of the debate, which included who could trash Planned Parenthood most forcefully, who good get in the most gratuitous mentions of “Second Amendment Rights,”who could genuflect most prayerfully to Ronald Reagan and of course to the late Justice Scalia, and –needless to say, who could most blatantly “diss” the President Obama. OK, good fun. We do not expect more from the candidates, and for Democrats it may have been gratifying to see this circular firing squad. But, and worth analyzing in the near future, is how the Story, how this Grim Fairy Tale, “trumps” substance or anything approaching decorum for our Media. It was actually Wolf Blitzer who— sorry Ladies– started with the most cojones (stern talk about the rules of the “debate”), but it was soon clear that no one was going to really rein in the punch ups and overtimes of the speakers. Alas, the most civil of the candidates were the sincere, sometimes provocative, but essentially not-of this-world Ben Carson and the bemused, adult Gov. Kasich– probably the candidates with the least conceivable chance of success in these primaries. It was sweet of Sens. Rubio and Cruz to welcome George Bush the Elder as a member of the audience in Houston I wonder what that was about? Hmmm. The Democrats Might take some heart by the evening’s athletics, but I think the press: paper, electronic, and digital has become so inured to the entertainment at the expensive of enlightenments, that That is the scary part. Unless Scarier is that a lot of the public apparently wants this– and they do influence the media, not just the other way around! Senator Marco Rubio, alarmed by Donald J. Trump’s ascendancy and worried that his presidential chances were slipping away, unleashed abarrage of attacks on the real estate mogul’s business ethics, hiring practices and financial achievements in Thursday’s debate, forcefully delivering the onslaught that Republican leaders had desperately awaited. In a series of acid exchanges, a newly pugnacious Mr. Rubio, long mocked for a robotic and restrained style, interrupted Mr. Trump, quizzed him, impersonated him, shouted over him and left him looking unsettled. It was an unfamiliar reversal of roles for the front-runner, who found himself so frequently the target of assaults from Mr. Rubio and Senator Ted Cruz that he complained they must have been a ploy for better television ratings. From the opening moments of the debate, Mr. Rubio pounced. Deploying his own up-by-the-bootstraps biography, the Florida senator assailed Mr. Trump for hiring hundreds of foreign workers at his tony resort in Florida and passing over Americans who had applied for the same jobs. Moments later, Mr. Rubio moved to cast Mr. Trump as a huckster who outsourced the manufacturing of the clothing that bears his name to countries like Mexico and China even as he promised to wage a trade war against those countries. When Mr. Trump tried to protest, Mr. Rubio interrupted right back. “Make them in America!” he demanded. The acerbic and urgent tenor of the exchanges reflected the panicked state of a Republican field determined to halt Mr. Trump, whose crudely freewheeling style, abundant self-assuredness and durable popularity have produced three consecutive early-state victories that threaten to put the nomination out of reach for his two biggest rivals, Mr. Rubio and Mr. Cruz. The two-hour rumpus frequently devolved into unmediated bouts of shouting, name-calling and pleas to the moderators for chances to respond to the latest insult. 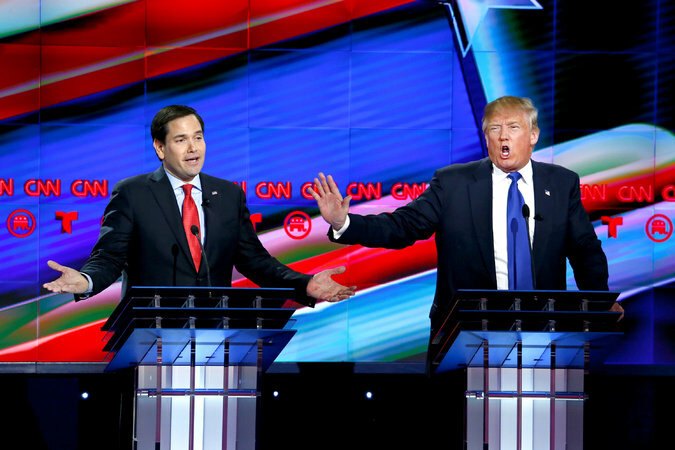 “This guy’s a choke artist,” Mr. Trump declared, pointing to Mr. Rubio. “This guy’s a liar,” he said, swiveling toward Mr. Cruz. The timing of Thursday’s debate in Houston, days before 595 delegates are awarded in voting across the country on March 1, made it among the most anticipated and consequential debates of the Republican campaign season and the first to feature a shrunken field of five candidates. After resounding defeats at the hands of Mr. Trump in the past two primaries, both Mr. Rubio and Mr. Cruz walked onto the stage confronting treacherous paths ahead and a pressing dilemma: whether to keep trying to destroy each other, their comfort zone in past debates, or to aim their fire at Mr. Trump.